One of the benefits of Amazon’s (s amzn) AppStore for Android devices is a free software title each day. It’s a shame the store isn’t available in all countries just yet, but today’s free app is so good, I’d buy it anyway. Business Calendar, normally $4.99, is the free offer right now, and I’ve used a beta release of it since January of this year. It’s a must-try, for sure. Simply put, if you want a better calendar application on your Android smartphone or tablet, today is the day to get it at no charge. Business Calendar is about as full-featured as you can get for a calendar app. It supports any number of Google (s goog) calendars. I have at least seven going at one time because each member of my family uses a shared calendar, plus I have a few for work purposes. The software offers multiple views as well: agenda, day, week and month. That sounds like standard fare for any calendar app, but Business Calendar takes things a useful step further with on-the-fly visual adjustments. In month view, for example, tapping one icon either adds or removes text from calendar events. Tapping on a specific date in month view brings a pop-up message with the scheduled events for that day, each of which can be tapped for details. The weekly view is highly customizable as well. A scroll bar at the bottom lets you change the date range from between a single day to 14 days. If you have a packed week with a ton of appointments, you can use a pinch-and-zoom gesture to hone in on additional event details, which is super for smaller-screened devices. Searching for events is supported too. At any point when looking at the month view, you can focus on the calendars of your choice. Each calendar appears as a small tab on the bottom of the app; simply tap one to hide it or add it to the view. Another extremely handy feature on the monthly calendar is swiping your finger over a few days or a week to quickly switch to the week view. And although the top bar in any view normally displays the time period shown, you can tap it for contextual help. 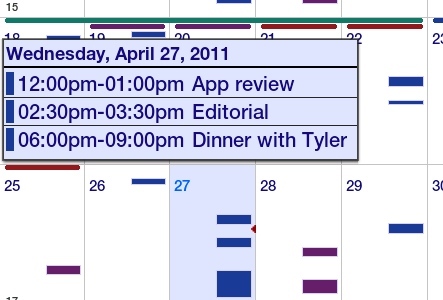 Of course, Android is known for its widgets, and Business Calendar adds a dozen to use. Essentially, they’re all the same widget, but vary in terms of size, ranging from a 2 x 1 widget all the way up to a large 4 x 4 size. The widgets are fairly full-featured and completely customizable to show different details across various date ranges. Tapping the widget opens the Business Calendar app ,although that’s not always necessary since you can add events or change views directly in the widget. With so many features and smart user interface cues, the app is well worth a $4.99 purchase. At free? It’s a no-brainer, since you can always uninstall it. But I suspect most who try Business Calendar will keep it. In fact, I wouldn’t mind seeing Google buy the software outright and integrate it with Android as the native Calendar application. For folks who can’t get the free version from Amazon, there is a no-cost, ad-supported version in the Android Market to try. I highly recommend it. I tried it but found it somewhat cumbersome. I am trying several at the moment and the one that seems to be the most interesting is Timewise. It’s only in beta but seems to be solid. I’m using Jorte and very happy with it; interface looks similar and it is free! Thanks to this article (and tweets from Kevin), I downloaded the Amazon App Store and Business Calendar. So far, loving it. Nice work Kevin! How does it compare to Jorte? Have you compared it with Pocket Informant’s Android calendar?